We’d love your help. Let us know what’s wrong with this preview of How to Breathe Underwater by Vicky Skinner. Now in a new home, new school, and faced with the prospect of starting over, K Kate’s father has been pressuring her to be perfect for her whole life, pushing her to be the best swimmer she can be. But when Kate finds her dad cheating on her mom, Kate’s perfect world comes crashing down, and Kate is forced to leave home and the swim team she's been a part of her whole life. Now in a new home, new school, and faced with the prospect of starting over, Kate isn't so sure that swimming is what she wants anymore. But when she decides to quit, her whole world seems to fall apart. But when Kate gets to know Michael, the cute boy that lives across the hall, she starts to think that starting over might not be so bad. There's only one problem: Michael has a girlfriend. To ask other readers questions about How to Breathe Underwater, please sign up. Does this book has cheating? Vicky Skinner Parental cheating, yes. No cheating that involves the main character. When For almost ten years, Kates’s constant companion was nothing but the water. Her life usually revolved around swimming, but most of all, the pressure of competing and being the best so she can have her father’s approval. How to Breathe Underwater is a story that renders how we go on freestyle when it's too much and giving our best stroke when it is not enough. It is a heartfelt, moving story about pain, loss and new beginnings. ***Thank you to NetGalley, MacMillian Children’s Publishing Group – Swoon Reads, Xpresso Book Tours and Vicky Skinner for providing me an eARC in exchange for a fair and honest review! How to Breathe Underwater is a beautiful book taking you through self-discovery and realization. I thoroughly enjoyed reading this book. It takes you through love and loss and what a thoughtful book it is. This story is about Kate who is a state-championship winner in swimming. She has spent the last 10 years of her life swimming and competing to please her father, who is also her swim coach. But her father betrays her and her family. Kate moves to a new city with her mom. She tries to decide what swimming really means for her. She realizes that while she loves swimming and water, she really hate competing. She was doing all of the competing to just please her father who made her work harder every time. Now that she doesn’t have to please him anymore, she quits swimming in her new school. She has to find a new path for her and she is trying to understand all the changes that occurred in her life after she moved to the new city. I really loved the overall journey of Kate from her self-realization to achieving the things that actually mattered to her. She proved to be a strong character as the story progresses. She made mistakes like all teenagers do. But she was never afraid of consequences and was always ready to face them. Through all of her struggles, she learns to love and to open her heart. Michael was the love interest of Kate who lived down the hall in her building. She hadn’t known at first that he had a girlfriend and she started liking him. But when she found out about his girlfriend, it was too late for her to retreat her feeling. Between swim classes and salsa lessons, she falls for him and so does he. I totally shipped this couple and their romance was so adorable. Before they were romantically involved, they were friends and there were some quite cute moments in that friendship. Michael had a habit of smoking, because of her mother, but Kate helped her in quitting it. Both had their own problems to deal with and in this way, they found solace in each other’s company. I loved all the side characters. They were very well developed. I really liked how well Vicky Skinner has included so many heavy themes in this otherwise simple story. The issues are talked about as drama but in actual they never felt dramatic? Michael’s mom was in terrible condition because of smoking and he also was habitual to it. This shows how parents actions can make impressions on a child’s life. There are lots of teen-relevant issues shown like dealing with parents’ divorce, father-daughter relationship, falling for your friend’s guy, moving in new town and experiencing new love, and I think each of these things has perfectly been captured in the story. Kate spent the last ten years of her life working to be the best in order to earn her father's love, until he betrayed her and her family. Forced to start over in a new town, in a new school, in a new home, she had to figure out what swimming really meant to her, and if it even still belonged in her life. • Pro: I am a fan of feeling the feels, and Skinner definitely delivered. Kate's anguish with separating swimming from her father was palpable. Her emotions were raw and real, and I really felt Kate spent the last ten years of her life working to be the best in order to earn her father's love, until he betrayed her and her family. Forced to start over in a new town, in a new school, in a new home, she had to figure out what swimming really meant to her, and if it even still belonged in her life. • Pro: I am a fan of feeling the feels, and Skinner definitely delivered. Kate's anguish with separating swimming from her father was palpable. Her emotions were raw and real, and I really felt her pain as she struggled with trying to remember why she swam or if she ever enjoyed it at all. • Pro: Kate also wrestled with who she was without swimming. I love journeys of self discovery, and Kate had a long journey ahead of her. But I had faith in Kate. She had a lot more inner strength than she thought she did, and I found myself rooting for her to find herself and find some peace. • Pro: Michael and Kate together was romance gold for me. They had a great connection, and I really felt the stirrings of love between them. The situation was a little bit awkward, but I thought Skinner built a good enough case to explain the hows and whys, and I was ok with all of it. • Pro: The relationship between Kate and her sister was pretty wonderful. The whole family was kind of falling apart, but they were all still there for each other. • Pro: The final chapters were really strong for me. There were a lot of really joyful things that happened, which left me in a happy place. I was really glad with the path Skinner chose for these characters. • Pro: I am a fan of sports in books, and I was really glad that swimming was featured quite prominently in this story. The life of an elite athlete fascinates me, and getting a peek into their lives is always so eye-opening. Overall: A sweet, touching, painful, and sometimes fun story of one girl's quest to find herself and begin anew. Holy Smokes, albeit modern day romance clichés, this made me cry, laugh, and died out of swooning. For a book that had tackled a lot of themes and at this length? 304 pages? The topics went on so sincerely; pictured how it happened and dealing with it. Me crying over this book is an understate Holy Smokes, albeit modern day romance clichés, this made me cry, laugh, and died out of swooning. For a book that had tackled a lot of themes and at this length? 304 pages? The topics went on so sincerely; pictured how it happened and dealing with it. Me crying over this book is an understatement. • delivered the feels, completely and all at once. It made me sad, fall in love, belief, angry, hope, cry, everything! It didn’t fail to give those emotions. And if you’re a huge fan of feeling all sort of feelings I say go for it! • New beginnings, as Kate and the whole swimming team found out that Kate’s father cheated on her mom, everything she thought great went out the window. I am amazed how this narrative was written. Going through the pain of it and the amazing self-discovery unveiling had me smiling. • Kate and her sister’s relationship was undoubtedly great! With the event unfolding in their lives. They both have completely different views when it comes to family and friends. How they both voices out their opinions were sincerely done. • Kate’s relationship with her mother and father had been growing apart. And she has been hurt most by her father. How it all wrap-up was distinguished and powerful. Michael, well, their chemistry is strong. You can feel it immediately. And boy, if you’re into a slow burn romance. *Might want to consider this one. • It has a theme of sports, in out MC’s case swimming, her journey of falling in and out with her passion for the sport had me torn up. • As I mentioned earlier some sensitive themes, cheating issue, drug abuse, and dealing with illness. I am speaking for myself. And I find these issues were handled with such sensitivity. This book completely blew me away!! It was so different than what I was expecting. A well-written touching novel about change, grief, expectations and relationships. It deals with many important topics and it’s very real, depicting teenage life as it is, and showing that sometimes that things we envision for ourselves aren’t the best and sometimes we all get a little lost. It’s an intense journey about finding who you are, about dealing with other people’s expectations and with dealing 4.5 stars!! Prior to starting Vickey Skinner's How to Breathe Underwater, I hadn't heard too much about it. However, I can never resist a pretty cover and a synopsis that screams romance and contemporary goodness so I eagerly dove in. The result? How to Breathe Underwater was one heck of a treat! Romantic, emotional, and funny, How to Breathe Underwater managed to wow me the whole way through. How to Breathe Underwater introduces Kate, a high school junior, who isn't having the best year. She's dealing with Prior to starting Vickey Skinner's How to Breathe Underwater, I hadn't heard too much about it. However, I can never resist a pretty cover and a synopsis that screams romance and contemporary goodness so I eagerly dove in. How to Breathe Underwater introduces Kate, a high school junior, who isn't having the best year. She's dealing with family drama, friend drama, and starting all over at a new school. She's trying her best to be positive, but it's hard to do when everything seems to be going to wrong. I adored Kate from the get-go. She was sweet and kind, and I loved seeing her bloom in her new environment. I also appreciated how she always tried her best to do the right thing. Sometimes it all still blew up in her face, but you could tell she was always coming from a good place. Michael, the love interest in this, was SWOONY as heck! From the moment he was introduced I was praying he would be the one. He was the perfect mix of moody and light, and I loved the chemistry between him and Kate. It flowed well, and, more importantly, it made it easy to root for them! In addition to Michael and Kate, Vickey introduces a variety of other characters - Kate's friends, family, etc. Every single character brought something special to the book, and I loved pretty much every single one of them (well, besides Kate's dad...he was a bit of a jerk...scratch that a HUGE jerk). Vickey did a great job of developing everyone, and while I wish there had been more of them, I was 100% content with what I got. The plot in this mainly involves romance and creating a new life when everything gets turned upside down. I always love a starting fresh story line, and that rang true here. It was exciting to be there every step of the way with Kate. The romance in this had so much wonderful build up - there were so many times I was like "just kiss already!" but let me tell you, the wait was worth it in the end! Kate's world is turned upside down when her dad (and swim coach) is caught making out with a swim mom in his office.. in front of everybody. Her mom uproots her to be closer to her engaged sister.. and the rest is.. a boring, cliched story. I skimmed the last few chapters of this book because I just didn't want to waste precious reading time. Kate is a character that's hard to like or empathize with. The writing is mediocre and just nothing special. The insta love is cringey and silly. And the co Kate's world is turned upside down when her dad (and swim coach) is caught making out with a swim mom in his office.. in front of everybody. Her mom uproots her to be closer to her engaged sister.. and the rest is.. a boring, cliched story. This book takes a heartfelt look at how it can feel to move to a new school, have a crush on someone who is already spoken for, and deal with parental expectations that have become more of a burden than a blessing. I enjoyed the characters, and I also appreciated what felt like an insider's look into the world of competitive swimming. While there were small portions of this that I enjoyed, I think my favorite thing about it was that it was short enough to finish reading in a few hours on my plane ride to Washington DC. Just reading the synopsis clues you in on what the book will be like--kind of choppy, not always very well thought out, and a little repetitive. This book had a lot going on. Kate's dad cheats on her mom, resulting in chapter one: Kate moves to Portland with her mom. In the aftermath of The Affair, (view spoile While there were small portions of this that I enjoyed, I think my favorite thing about it was that it was short enough to finish reading in a few hours on my plane ride to Washington DC. Just reading the synopsis clues you in on what the book will be like--kind of choppy, not always very well thought out, and a little repetitive. This book had a lot going on. Kate's dad cheats on her mom, resulting in chapter one: Kate moves to Portland with her mom. In the aftermath of The Affair, (view spoiler)[we get Kate despising her dad and quitting swimming because everything good about it is now outweighed by the bad. We also see Kate alternately worrying about her mom and her mom basically not existing, Kate helping her sister leave her husband-to-be at the alter and then watching her obviously struggle with depression. We meet Michael and learn about his mom's bad health. We discover, after Kate has fallen hard in a matter of minutes for him, that Michael is dating Patrice, *gasp* one of the two girls Kate met in her first five minutes at school and almost immediately became best friends with. After this revelation, we are repeatedly treated to Kate's conflicting emotions over wanting to be friends with Patrice versus wanting to be with Michael...although if we're being real, this is more Kate lamenting the fact that Patrice is dating Michael so she can't be. Finally, throughout the book, we are witness to Kate struggling to keep her relationship with her long-time best friend alive after it immediately fell apart the second she moved. (hide spoiler)] With so many big conflicts, there wasn't enough time to devote to all of it, and it left everything feeling rushed and under-developed. Great story that made me laugh, cry, and super happy. Has a lot going on within the pages, but does a really good job at handling all the different subplots. 1. Fully developed cast. While Kate is the protagonist of this debut, she's not the only character with layers and flaws and problems. Her parents, sister, love interest, and friends all have challenges that play out alongside Kate's. I appreciate when a story feels as complicated as real life, and HTBU definitely does. 2. Sweet, slow-burn romance. Love doesn't come easy for Kate and her v. cute salsa dancing neighbor, Michael, which means that when they finally begin to work things out, the payoff is so worth it. 3. Skillful prose. For a book with a lot of heavy themes, HTBU remains a smooth and endearing read. Vicky infuses the novel with thoughtful commentary and just the right amount of humor, making it feel like a wonderful escape. Kate is a girl with her life on track. She’s a state winning swimmer, with amazing potential for college. Her dad is her supportive coach, always pushing her to do more. Her best friend is with her every step of the way, and everything seems perfect --- until her father is found cheating on her mother in front of the entire swim team. In order to start over, Kate and her mother move to Portland, leaving her swim team, father, best friend and entire life behind. Luckily, she meets Michael, the cu Kate is a girl with her life on track. She’s a state winning swimmer, with amazing potential for college. Her dad is her supportive coach, always pushing her to do more. Her best friend is with her every step of the way, and everything seems perfect --- until her father is found cheating on her mother in front of the entire swim team. In order to start over, Kate and her mother move to Portland, leaving her swim team, father, best friend and entire life behind. Luckily, she meets Michael, the cute boy from across the hall, who seems to be the only one without any expectations of her. As they grow closer, through swim lessons and ice cream dates, she finally feels happy again, until she learns that Michael has a girlfriend. With swimming, the one thing that used to always make her happy, and her family life becoming more and more twisted, will Kate be able to find a way to be happy? Or will she continue to sink until she can barely stay afloat. 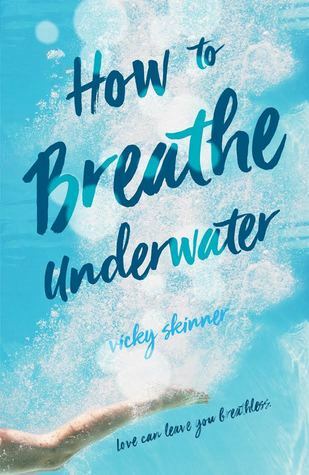 HOW TO BREATHE UNDERWATER, debut novel from author Vicky Skinner is magic, filled the high-energy drama, love and heartbreak of teen life. The characters in this book were to die for, so real and relatable, I felt as if I knew them myself. Michael is adorable, both kind and gorgeous, with just the right dash of daring. Every interaction between Kate and Michael was enchanting, and I loved reading them. Additionally the family dynamics are both terribly sad and beautiful at the same time. Kate’s sister, Lily, always added a bit of humor, and provided an extra layer to Kate’s already broken life that made me more attached and hoping for Kate’s eventual success. Most of all, I love to root for a protagonist, and I had no problem doing that with Kate. Her struggle over swimming, trying to fit in at her new school, relationship with her family and overall desire to do what’s right make her the perfect main character. One of my favorite aspects of the novel, was the relation to swimming. YA novels often inaccurately portray what lives of high school athletes can be like. HOW TO BREATHE UNDERWATER had no problem demonstrating the pressure and intensity that teenagers sometimes deal with through Kate and her best friend, among some of the other swimmers. Beyond that, I loved reading any scene where she was swimming, as the passion and excitement in her could be felt through the pages and straight into me. As much as I enjoyed the novel, there were a few times where the book felt predictable and a bit rushed. At the beginning of the book, events would move on quickly with lack of purpose, leaving hints that felt to be a bit obvious foreshadowing. Almost everything that was meant to be a surprise, or big twist in the book felt predictable, which I didn’t enjoy as much, but that didn’t lessen the emotional impact of each event. Even if I knew what was coming, Skinners writing makes every experience come alive, and I felt every up and down like it was happening in front of me. Skinner brings an amazing read for any fan of YA novels related to sports, or those who love a good realistic fiction book. With love, loss and the battle of high school, HOW TO BREATHE UNDERWATER is a necessary novel to anyone’s TBR list today. Thank you Vicky Skinner, Swoon Reads, and Xpresso Book Tours for a free eArc of this book in exchange for an honest review. This review was originally posted on my blog, June Reads Books. "Michael didn't expect anything from me. My father, my mother, even Lily, they all expected something from me, whether I was ready to give it or not. But Michael just looked at me like he was waiting. He was waiting to see what I would do next, what I would say next, who I would be in the next ten minutes" (p. 90). After Kate's father successfully ruins Kate's life by getting caught cheating by the WHOLE swim team, Kate's mother moves them out to Seattle to be close to her college-age sister, Lily. Not only does Kate need to deal with a wave of hurt, she also needs to get used to a new city, a new school, and being away from her best friend. Can anyone do that gracefully? Luckily, Kate's mom is one of those people persons and has made friends with people in their building before they're even unpacked--including this super cute boy named Michael. Michael from the get-go is kind and funny. Even though Kate's mom has already told him everything anyone needs to know about Kate, he still wants to know more and really invests in her. He's one of those characters that radiates sunshine and you just can't be sad when he's in the scene. Unfortunately, his life presents it's own set of challenges, specifically his mother, who's cough just keeps getting worse and worse. It's clear that Kate and Michael deal with their struggles in different ways--Kate is angry at her dad and scared of life without swimming, terrified of learning how to breath again. She tries to make the most of her situation by making friends, but her emotions are fairly close to the surface. Michael pushes his emotions down, instead focusing on being positive and having fun. As they wrestle through the hand life has dealt them, I loved seeing it shape who they are, how to support each other, and how they feel about each other. My heart couldn't get anymore full. How to Breather Underwater sucked me in from the start. This author's writing style is really enjoyable. We see a lot of books in the YA genre about teenagers that end up having some family problems. This was the first one I read where the main character starts questioning her passion for the sport she thought she loved. Kate is really hurt when she finds out her father has been cheating on her mother. Her mother moves them to another city and this turns her life upside down. Another school, home and new swimming team. That's when things get tricky though, she starts freaking out at the thought of swimming or even being in a pool. Not only is she in a new location, but her schedule is different as well. No more intensive swimming schedule, diet and more time for a social life. Kate meets Michael (her neighbor) and they connect. He has some problems of his own, buts she trusts him. I loved reading about Kate trying to adjust to her new life and how she feels. Of course she's hurt and doesn't know what to think of her father anymore, let alone swimming. Her best friend is in a different own and constantly swimming with her father and she feels a bit betrayed. I loved Michael's character and he was very strong for a boy his age. Dealing with family issues will do that I guess, but not everyone can handle that. He's also a rock for Kate when things fall apart for her. I think that made it easier for Kate to decide not to swim for awhile and think about what she really wanted. Kate's journey was a very interesting one and I am happy this author wrote it. Even though her relationship with her Dad became hurtful, she became closer with her mother and sister. The unconditional love they had for each other was very touching. There were a few things that bugged me though, I felt like we missed some information about Michael. I know this was Kate's story, but Michael was a big part of it as well. His story would've been so much more real if maybe we got his POV as well. Kate's sister has some issues of her own and in ways I didn't completely feel that it fit in this story. While it did, it didn't get a lot of attention, so it kind of felt out of place. Even though I loved how her story ended! Also, the way Kate is treated when her friends think she was cheating with Michael. Yes, it may have seemed that way and things may have gone fast, but I hated how she was treated. Then again, I know that high school can work this way. Kate is a fairly average teenager, save for one big exception, she's the best swimmer in the state. With her dad as her coach constantly pushing her to do more, be better, work harder, etc. there's a lot of emotional baggage tied into her sport. When Ka There's a lot to unravel here, so bear with me. I'm still in awe of the profound emotional roller coaster I just experienced with this heartfelt story. Skinner has a way with words that elicits your emotions and keeps you engaged page after page. This book was full of feelings! It was really well written and it was easy to sympathize with the main character Kate. Her dad was caught cheating, so Kate's mom decided to move them to Portland to start a new life. Kate went through tons of growth in this book. She was a really amazing swimmer who swam on her dad's team. When she was away from him, she had to decide if that was something she actually wanted. Her struggle with determining how she wanted to proceed with swimming was realistic and This book was full of feelings! It was really well written and it was easy to sympathize with the main character Kate. Her dad was caught cheating, so Kate's mom decided to move them to Portland to start a new life. Kate went through tons of growth in this book. She was a really amazing swimmer who swam on her dad's team. When she was away from him, she had to decide if that was something she actually wanted. Her struggle with determining how she wanted to proceed with swimming was realistic and heartbreaking. She also had ups and downs in all of her relationships. She left old friends, made new friends, met a boy she likes, and found out said boy has a girlfriend. Kate and Michael had a really great relationship. I really enjoyed their interaction, but the fact that he had a girlfriend made it a little difficult to get behind their relationship 100%. I really loved her relationship with her sister. They were extremely close and we're really there for each other in some difficult times. Overall, this book was really good. It was heartbreakingly sad in so many ways, but it was well worth the read. I would like to start by saying the only thing I allowed to be colored by my favor of the author was the fact that I picked the book up in the first place. I do not read YA Romance, or really any romance these days, and I certainly never read first person POV. I would not have normally picked this one up and given it a chance, and that disappoints me, because I know others won't get it a chance for those reason. Because this book was amazing! Vicky's writing style is on point! With a unique persp I would like to start by saying the only thing I allowed to be colored by my favor of the author was the fact that I picked the book up in the first place. I do not read YA Romance, or really any romance these days, and I certainly never read first person POV. I would not have normally picked this one up and given it a chance, and that disappoints me, because I know others won't get it a chance for those reason. Sounded like a mix between Coming Up for Air and Anna and the French Kiss, but it had none of the sparks I anticipated. Honestly, it bored me at times, made me cringe at others. Maybe it was just not a book for me, who knows, other people seemed to be into it. This book was simply charming. The characters were relatable and beautifully flawed and kept me turning the pages. I actually forced myself *not* to finish it in one sitting because I so wanted it to last! Kate was a complex main character and I thoroughly enjoyed facing all sorts of highs and lows with her. On a personal note, as someone who has severe anxiety (and a slight fear of the water), the rep here was spot on and executed extremely well. Allllll of that fantastic stuff aside, the roman This book was simply charming. The characters were relatable and beautifully flawed and kept me turning the pages. I actually forced myself *not* to finish it in one sitting because I so wanted it to last! Kate was a complex main character and I thoroughly enjoyed facing all sorts of highs and lows with her. On a personal note, as someone who has severe anxiety (and a slight fear of the water), the rep here was spot on and executed extremely well. Allllll of that fantastic stuff aside, the romance between Kate and Michael gave me serious swoons. And, honestly, I wasn't sure until the end how/if things might work out--A+ on avoiding predictability. How to Breathe Underwater... this book has all the feels! Kate, a champion swimmer for her school's high school team, is challenged by family issues; she is forced to move to a different school district with her mom and sister. She emotionally struggles in the new city without her best friend, but quickly finds caring peers. Be prepared for butterflies, giggles, tears, heartbreak, and surprise twists throughout. Ending was rushed, but enjoyed overall character journey. Adored this book! The character development was lovely and I couldn’t stop reading. I LOVE this book! I LOVE the characters! I love how there are issues and drama in this book without being dramatic. Every one of us has gone through something like one of these characters. And we need a book like this to know we’re not alone. To know we’ll get through. There’s a teen out there right now who needs this book. It can change lives. In author Vicky Skinner’s novel ‘How to Breathe Underwater’ readers follow in the strokes of Kate who has spent her life being a competitive swimmer. Kate has her whole life figured out, but when her dad, who is also her swimming coach, cheats on her mom, Kate and her mom leave and move to the city of Portland. Kate has to start everything over—new life, new school, new friends, and new…love interest? Kate quits swimming, which is a big blow since it was the one thing she had, her mom is sufferi In author Vicky Skinner’s novel ‘How to Breathe Underwater’ readers follow in the strokes of Kate who has spent her life being a competitive swimmer. Kate has her whole life figured out, but when her dad, who is also her swimming coach, cheats on her mom, Kate and her mom leave and move to the city of Portland. Kate has to start everything over—new life, new school, new friends, and new…love interest? Kate quits swimming, which is a big blow since it was the one thing she had, her mom is suffering from depression, and her sister decides to cancel her wedding—all due to Kate’s father’s actions. Kate tries to find other things to occupy her mind. And then she meets Michael, the boy across the hall and quickly they become friends. Things are finally starting to look up. As Kate and Michael build their friendship, Kate must jump another hurdle when she finds out Michael has a girlfriend. Maybe things aren’t looking so great. Can Kate overcome the ghosts of her past and look towards a brighter future? And without swimming, her one crutch, can she keep her new life from drowning too? Vicky Skinner does a great job of creating relatable and honest characters. Each character has flaws, and faces problems and challenges which builds a complex story with deep character growth and development. Through its characters, ‘How to Breathe Underwater’ deals with tough topics in a lighthearted and humorous way. For fans of complex stories and relationships that like a bit of sports mixed in, ‘How to Breathe Underwater’ is surely a book for their shelves. If you like romance and new beginnings, you'll love Kate. She and her mom have just moved to a new city and a new school after a scandal tore their family apart. As Kate struggles to come to terms with her father's infidelity, she abandons the one thing she's always had -- competitive swimming. Her father was her coach and she can't look at a pool without seeing him. As Kate starts her new (non-swimming) life, she meets the literal boy next door, her across-the-hall neighbor Michael. The two for If you like romance and new beginnings, you'll love Kate. She and her mom have just moved to a new city and a new school after a scandal tore their family apart. As Kate struggles to come to terms with her father's infidelity, she abandons the one thing she's always had -- competitive swimming. Her father was her coach and she can't look at a pool without seeing him. As Kate starts her new (non-swimming) life, she meets the literal boy next door, her across-the-hall neighbor Michael. The two form a fast friendship, and Kate realizes she's falling for him. But Michael has a girlfriend, and Kate has enough on her plate without thinking about boys. She's doing all she can just to keep her head above water. I am not a huge relationship based book reader but this one was great! The relationships felt real and maybe because it hit a little close to home is why it made me cry. The story is well-written and takes on relationships between friends, parents, and lovers. I look forward to reading more by Vicky Skinner! This book is about Kate who is uprooted from her home and shoved into a new school trying to find new friends and her place in a new city. It truly is about learning how to breathe when you f I am not a huge relationship based book reader but this one was great! The relationships felt real and maybe because it hit a little close to home is why it made me cry. The story is well-written and takes on relationships between friends, parents, and lovers. I look forward to reading more by Vicky Skinner! This book is about Kate who is uprooted from her home and shoved into a new school trying to find new friends and her place in a new city. It truly is about learning how to breathe when you feel like you are drowning! Loved it! This book grew on me as soon as I put it down. Kate is someone that I think everyone can relate to in some way....doesn't everyone struggle with deciding what they want vs. what their parents want for them at some point in their life? (If this hasn't happened to you then I guess this book won't resonate with you as much as it did me). Throw in a cute boy that she isn't sure she can have and Vicky Skinner has written a fun, touching book that had me rooting for Kate until the last page. Vicky Skinner was born and raised in Texas, where she started writing novels about kissing cute boys when she was fifteen and eventually earned a BA in Literary Studies from The University of Texas at Dallas. She’s a full-time writer, a part-time runner, and she currently lives in Dallas with her husband.